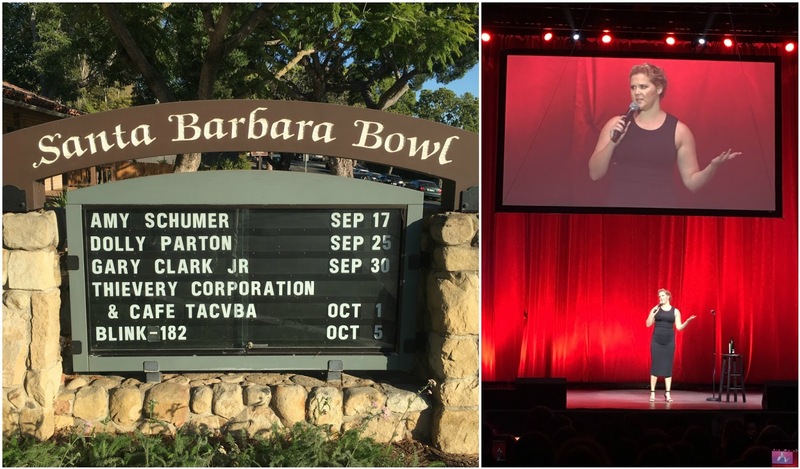 my favorite venue for concerts and comedy lies an hour up the coast from malibu, the santa barbara bowl. built into a hillside, this amphitheater has amazing acoustics and an intimacy seldom found with artists reaching far and wide. balmy nights offer exceptional ambiance at the performances this bowl serves up considering the pint size of the place. think boutique as opposed to department store. crosby, stills, and nash, janet jackson, santana, james taylor, bruce springsteen, a barefoot jack johnson, and most recently, the funniest comic i've ever seen as well as my present obsession, amy schumer. the artists are quite varied so if you like what you see in the lineup, the s.b. bowl is a must see! the drive up the pacific coast highway from malibu is terrifically beautiful as you hug the coast line this-close and just when you think it couldn't possibly get more gorgeous, the p.c.h. takes you through a gigantic boulder with climbers on the ocean side and a huge sand dune filled with "sledders" on the other. a sight to be seen in and of itself. the bowl is situated in a neighborhood which makes for difficult parking; uber, please! the upshot? s.b.b. is located on the same street as la super rica restaurant, the taqueria made famous as one of julia child's favorites. this makes me a very happy girl. more a taco stand than proper eating establishment, you can find me at this "line out the door and down the street" hole in the wall pretty much any chance i get. it's that good. but there's so much more to see and do, along with a concert, in the santa barbara and montecito area. walk the long expanse of butterfly beach, shop montecito's coast village road or santa barbara's state street (my favorites are angel and wendy foster, respectively), go to the santa barbara zoo with or without the kids, rent a surrey and cruise the bike path. amazing restaurants at every price point you can imagine. besides la super rica, try out the recently opened "the lark" for more of a fine dining option. after 10 years with my husband i was over the moon when he surprised me with a long awaited weekend to the four seasons resort biltmore santa barbara. sweet man knows i am completely and madly in love with this hotel as i've spoken of it with a spring in my step and a lilt in my voice. the lobster reuben is something dreams are made of, and eating them on a chaise while lounging around the pool only makes them taste that much better. part and parcel of the biltmore is the coral casino beach and cabana club. just across the street and available to biltmore guests, this historical landmark and private swim club gives the impression of old hollywood glamour emanating an elegance and sophistication that can only be described as an era long since gone. i could go on and on but suffice it to say this place is really hard to beat from the location to vibe to the not-to-be-missed spa that just happens to carry kai... the four seasons biltmore is situated on my best of the best list.